1, I hear you were in Baby Driver? I loved that film! What were you doing? 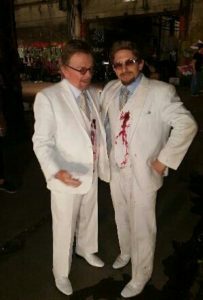 Yes I doubled for Academy Award winning musician Paul Williams (Rainbow Connection) who was playing The Butcher, so it was the warehouse scene where he gets shot in the white suit. They shot it wide from behind, and that’s me falling. 2, How long did it take to shoot? I was on set for a week, doing overnights down in Atlanta. 3, And how much footage do they get from that amount of time? I did a lot of falling! They shot it from many different angles. It was a gunfight so there was a lot of time where I was laying on the concrete and they were shooting everything else around. I think Paul was only there the first night and then the last night for a couple of quick pick ups. 4, I want to ask you if Baby Driver was a fun set to work on, but if you’re doing stunts can it be fun or are you just concentrating the whole time on keeping it safe? That was actually my first gig and it’s set the bar crazy high! Edgar Wright, the director, who I was a fan of before I worked for him, knew me by name after the first night. He was showing me playback of the fall, and giving me high fives. I hope he continues his amazing work because he’s just a brilliant guy to work for. I moved to New York to do the acting thing, like most people do. I went to acting school, and I did a stage combat course, and while I was there it was recommended I look into stunts. I’d never really thought about it and was just like, “ok yeah”. That lay dormant for a while and I fell into my day job as I had to pay my rent. Then in 2011 I made the conscious decision, “ok I want to do stunts”. I’ll still do the acting stuff if it comes up, and it does come in handy – I was on Blind Spot doing a fight scene, and they literally handed me a paragraph of lines to learn in 10 minutes. So I was like, no problem just give me 10 minutes, and I’ll figure it out. 6, If you could go back in time and do the stunts for any action film which would it be? The back in time stuff is interesting, as I am a big fan of the stunt actors of the early silent films who started it all. Harold Lloyd being my favorite and of course Buster Keaton and Charlie Chaplin. Just being able to figure everything out from the very beginning would have been amazing to be a part of. 7, Have you got a least favourite stunt? When you get to a set and they want you to do this and you’re thinking “oh no”? Yes, they wouldn’t do that, they wouldn’t throw that kind of curveball. Normally if you don’t know what you’re going to be doing it’s expected to be the basics. Fall down, get shot, fight scene, nothing ridiculously hard because you’re expected to know all that stuff. But if it’s a specific skill they’ll ask you ahead of time so you have time to prepare. Or say yes. Or no, you can’t do that. You’d never want to lie in this industry because it could kill you. Interview with stuntwoman Ilyana Eberhardt.